I keep on hoping that I’ll get back to my usual routine of cooking and posting at least three times a week, but I guess it’s not as easy as I thought. I need a posting buddy…or just somebody to prod me every time I procrastinate. If you have an extra sharp object and you live near Ontario, please I wouldn’t mind a prod every two to three days. I made this bread last November. It was so tasty we just polished it off in one sitting. It was meant to accompany some soup but I doubt if the soup was ever accompanied. I just slathered chunks of butter and spent the afternoon nibbling and worrying about the extra calories. It’s best served warm, so should it cool down you could just pop it into the microwave for a few seconds. I have a few friends who don’t like olives, my daughter inclusive. I have never understood why one wouldn’t like olives because they are one of my favourite snacks. Try serving some the next time you have a meeting. They are certainly better than calorie filled sweets or chocolate and anyway you can only eat so many olives in one sitting. If you are not an olive fan you can substitute the filling with any other ingredients you prefer, but make sure you add some cheese. There’s nothing better than melted, gooey cheese oozing out of freshly baked homemade bread. Preheat oven to 375°F (190°C) 15 minutes before baking bread. Grease a 9 x 5 inch loaf tin (pan) with oil or cooking spray. 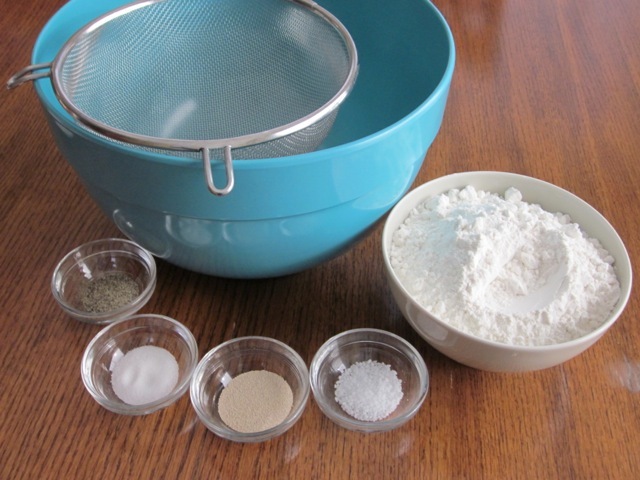 Sift the flour, yeast, pepper, salt and sugar into a bowl. Make a well in the centre. and knead for 5 minutes until smooth and free from cracks. Place in a lightly oiled bowl, cover with cling wrap (plastic wrap) and leave in a warm place for 50-60 minutes or until doubled in size. 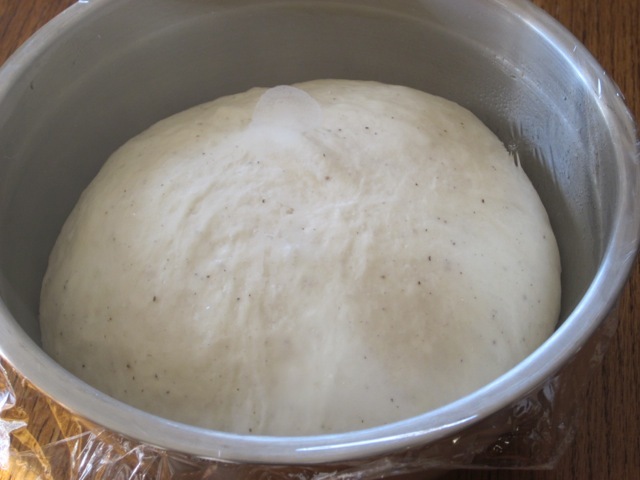 Knock back the dough, sprinkle with flour, cover and let rest 5 minutes. 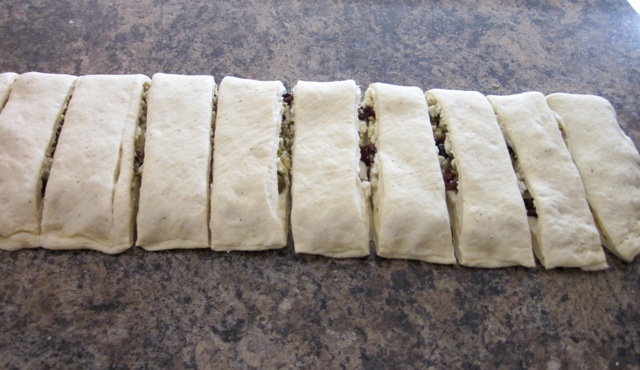 Fold the dough over the filling and seal the edges with your fingertips. Use a sharp knife to cut the dough, width ways into 10 slices. and carefully place in the pan, cut side down. 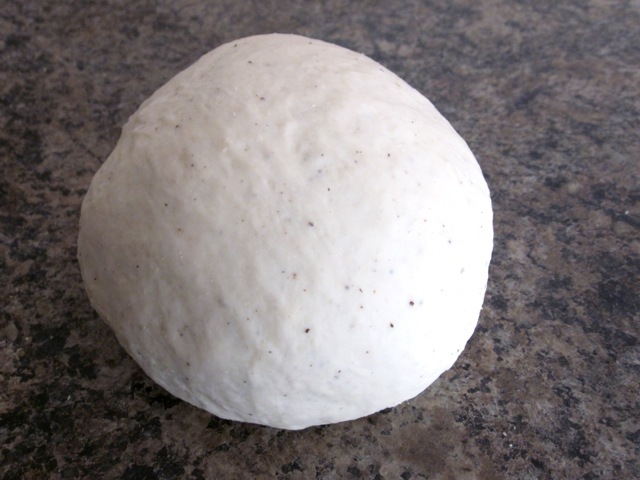 Using your hands, press down on the surface of the dough to make it even. until well risen to the top of the pan (tin). Bake for 35-45 minutes until golden. When cooked the loaf will sound hollow if tapped on the base. Preheat oven to 375°F (190°C) 15 minutes before baking bread. Grease a 9 x 5 inch loaf tin (pan) with oil or cooking spray. 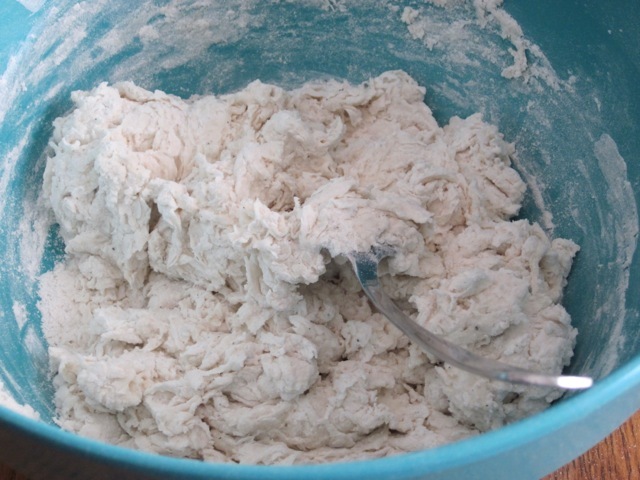 Turn the dough onto a floured surface and knead for 5 minutes until smooth and free from cracks. Place in a lightly oiled bowl, cover with cling wrap (plastic wrap) and leave in a warm place for 50-60 minutes or until doubled in size. 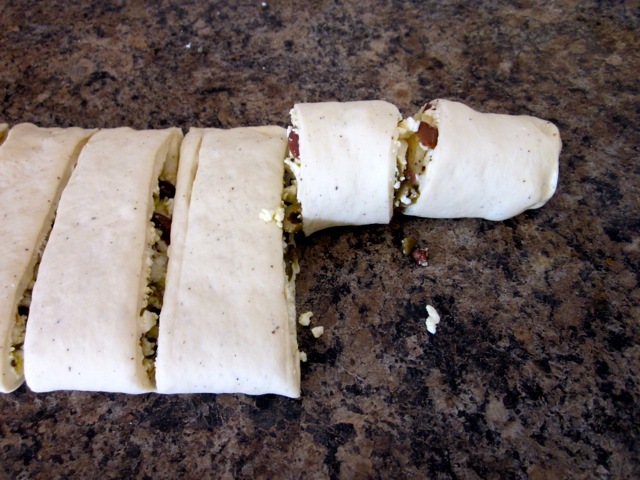 Fold the dough over the filling and seal the edges with your fingertips. 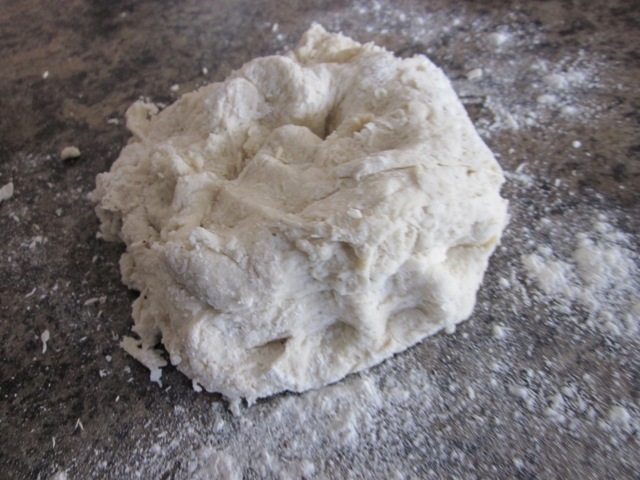 Use a sharp knife to cut the dough, width ways into 10 slices. 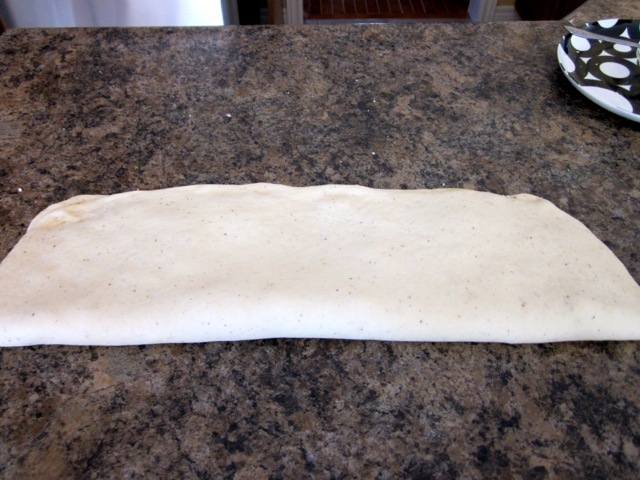 Roll up each dough tightly, lengthways and carefully place in the pan, cut side down. 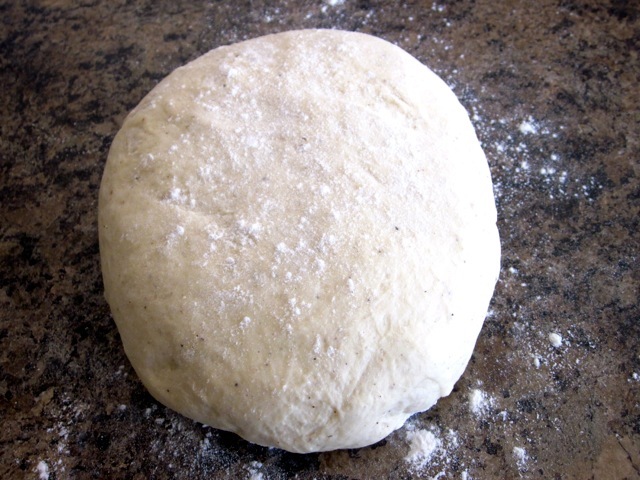 Using your hands, press down on the surface of the dough to make it even. 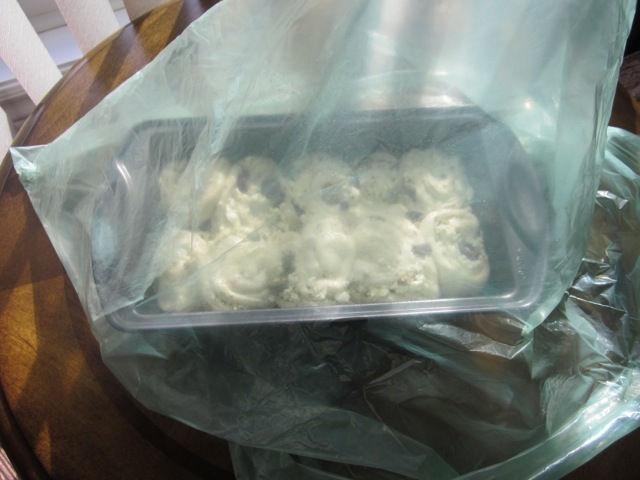 Cover with a large polythene bag and set aside in a warm place for about 1 hour until well risen to the top of the pan (tin). Bake for 35-45 minutes until golden. When cooked the loaf will sound hollow if tapped on the base. Pull-apart and enjoy. This bread is best served warm. For cup measures: spoon the flour into the cup, heaping it up over the top, then slide a knife across the top to level off the extra. Be careful not to shake or tap the cup to settle down the flour or you will have more than you need. I use American 240ml cup. Please note that oven temperatures are given as a guideline only. You may need to add or reduce the suggested temperatures depending on your oven. I baked the bread at 375°F (190°C) for 35 minutes. 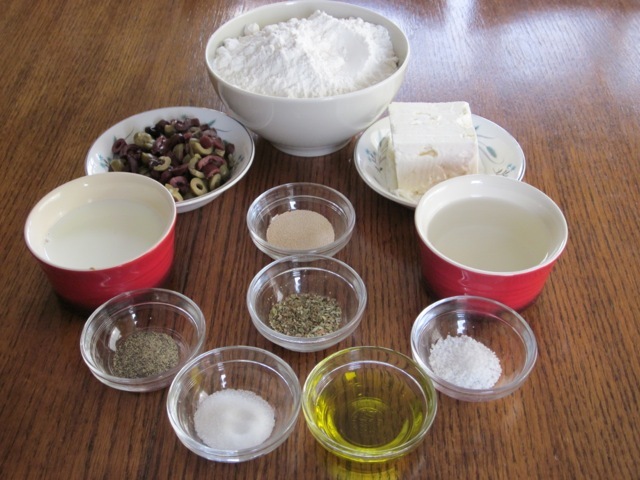 Variations for filling: ¼ cup pesto, ½ cup sun-dried tomato and about 1 cup finely grated Parmesan cheese. Hi Liz, I cooked this recipe on a Kamado Joe Grill – worked perfectly. I have a blog and have included your recipe and linked back to here. Many thanks for sharing, it was delicious! Thank you very much for the feedback, Jason. I’m so glad you loved the recipe. What is a Kamado Joe Grill? I am terribly sorry I have never left it in the fridge so I can’t help you on this one. I would like to imagine it would work but I have never tried it. I’m sorry I can’t help you on this one. Have a pleasant weekend! I am a proponent of good quality ingredients, so I completely agree with you. Good olives are irresistible. How goes life? Sorry I had so many pending messages. I’m just almost clearing the backlog. Enjoy autumn. The bread tastes delicious. You can also omit the olives if you want. But I think the combination of Feta and olives is just great! I totally support your perfect arrangement!!!! I made your lovely special pull apart bread today & it was fun to make it! Thank you for making the bread. I’m glad you even had fun, making it. I wish you could send me a slice of the left overs.I wish you a very happy week. Hi, Liz! 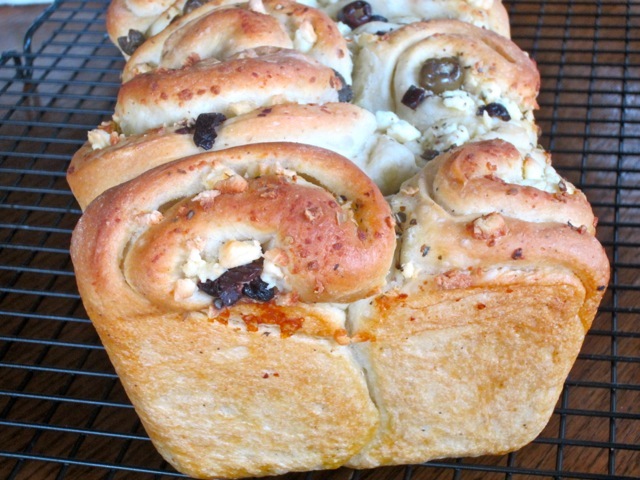 I love olives and this bread looks gorgeous! Yum! Omg I’ve taken so long to respond. Thanks for complimenting the bread. It was totally delicious!!! Amazingly yummy bread Liz! Sooo soft and fluffy! Thank you Sadia. How goes life. I am on my way to see what you’re cooking!! That looks so light airy and fluffy soft. Ohhh my goodness! Great enjoy there rest of the year. Thank you for pinning! You are a phenomenal!!!! Finally spring is here for us!!! We are actually hitting double digits and with lots of sunshine. I was basking today for about an hour. How is life for you? I am on my way to the yellow farm house rich now!!! Have a great Sunday!!! Oh yes today we had a wonderful weather (23C) what is that in Farenheit?….googled it 74F. How have you been my dear? I am fine and still sorting out a few things here and there but Boy a’int I glad to see you? Have a fantastic week! Our weather is still fluctuating, but overall I cannot complain. My lawn is starting to dry out and am just not in the mood of watering grass this year! I hope you have a wonderful week!!!! I hope the grass is still fine? did you eventually get the rain? The grass is fine Liz – thanks for asking! However, some of my flowers, even some perennials, had it really, really hard this summer due to the lack of rain…. and the lack of being watered…… but the gardens do look nice in spite of the bit of neglect. It sound like they didn’t die, despite having a hard time. I haven’t tended my garden in weeks! This week I shall try and do something about it! I keep ‘meaning to’… and that’s as far as I get…. How about posting some photos of your gardens? We’d love that!! Ha ha ha, do I really have a garden worth taking a photo? I shall see if this can be done. Have a wonderful week! Thank you Sophie. I hope life is good for you as usual. Have the best of the week! Thanks for making the bread. I truly hope you enjoyed it the way we did! Have a wonderful week! This looks so good I had to make it! The first rise is happening now as I type! Can’t wait to smell it baking! Omg how did it go? I have just seen it. I sincerely hope you loved it. Have a wonderful weekend. Thank you for loving my step-by-step. Happy baking. I hope you’ll love it!!!! omg. i’ve seen pull-a-part breads before but they’re always sweet. Now this is my kind of bread. 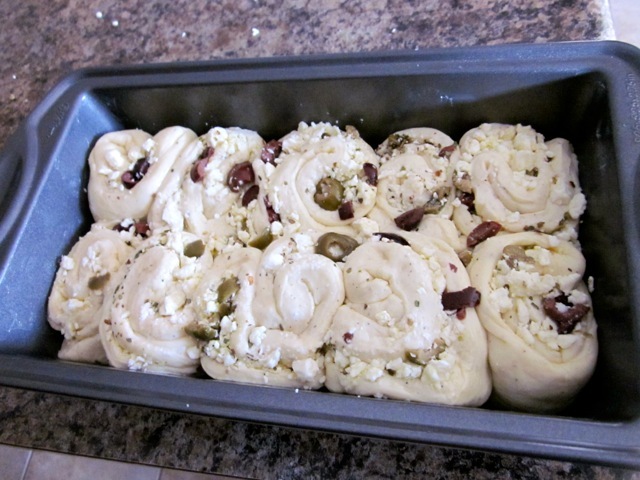 Olives, feta, and dough. FAbulous!!!!! Thank you, Chef Mimi. Have a wonderful weekend! Oh yes I came back and took off again and now I’m trying to come back again before summer starts. I hope you’re having a great time blogging. I wish you all the best!!! Thanks, Chef, I hope you find time to make it, soooon! Consider this a prod, from far away. This sounds and looks delicious, Liz. I’d dip the pieces in olive oil and eat the whole loaf for lunch. Ha Ha ouch! that was sharp and stingy. A whole loaf for lunch? Not too bad! Best wishes! Thank you, Rosa. It was pulled apart and totally demolished! Have a great one! There’s no way this is anything but delicious. Of course it’s very delicious. Thanks and great day to you! This bread looks amazingly delicious! So happy to see something yummy from you again! Oh yum, I love a pull apart bread. I am one of those people you don’t understand….I really dislike olives! I bet sun dried tomatoes would be tasty though. So glad your back, looking forward to more delicious drool worthy posts! Ha ha even my own children don’t like olives. I seem to be the odd one here. I think sundries tomatoes would be great too. Thanks for alway being here for me. You are so kind. Hey Liz… Glad to see you blogging again! This looks and sounds amazing! Thanks so much. I am busy with other things so my progress has been slow but I hope to speed up a little bit in the coming weeks! I am so happy to see you. Take care and wish you the best of 2015!!!! Looks Mediterranean and tasty. I love olives. By the way, do you have a favourite celebrity chef? I love olives too! My favourite Celebrity chef would be Gordon Ramsay. I love the way he cooks in minutes and makes everything seem so easy. Have a wonderful week! You are welcome to swap them out for whatever your heart may desire. I have made this bread with some cheese and bacon and another time with sun dried tomatoes and cheese. The possibilities are endless. You can even make it sweet, of course! Best of times! I am so glad you stumbled upon my blog. I love visitors and love Feta and Olives too! 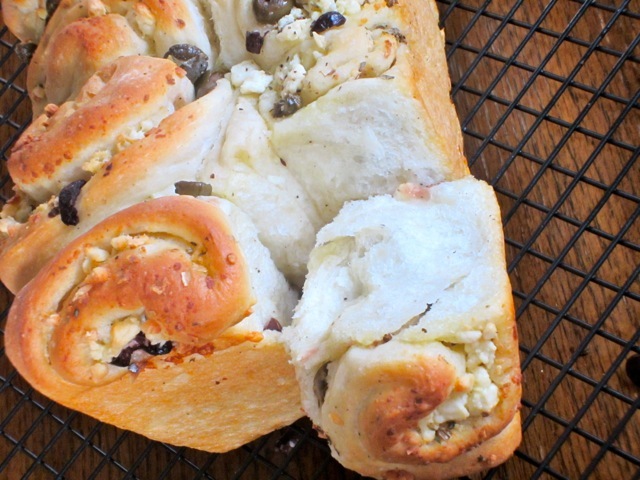 Feta and olives on bread sounds like an easy and hustle free alternative. Thanks for your compliments and wish you a great week! I hope you visit more often! I hope you find some time to try….wish you a happy cooking and enjoy the rest of the week! Ha ha, welcome to the club. It was gone before the soup arrived. Have a great week! I’m drooling just looking at the picture and I don’t even like olives! Nice to see the occasional post Liz. But, don’t beat yourself up over not posting regularly. The bread looks absolutely scrumptious, although I might tend ti substitute cherry tomatoes or pumpkin seeds. I’d been hearing about the cold and snow back east from relatives, and I don’t say this to brag, but we have had the most fantastic winter. Not a speck of snow and often double digits! We will send it your way and hope it arrives soon! Take care Liz! Ha ha Sandy, I swear you are bragging…I saw a glimpse of spring on TV and said “maybe I should just move to BC” Some friends of ours are moving to BC in August. They are fed up of the cold Ontario weather. I have just been shovelling some heavy snow. There was a grunt and a whine with every shovel scooped. Boy wasn’t I glad when it was finally done? My arms are aching beyond repair. I have found a new passion, wine….will be posting on wine soon. You can sub with cherry tomatoes or pumpkin after all when I said “some friends” I meant..Sandy…LOL. Have a lovely week, Sandy. Best regards to your family!!! Ah, you are a girl after my own heart! I have a new favorite wine….I like white, it’s called “Wine o’clock”! Fits my lifestyle. Lol. I’ve jusrpt sold my condo privately and purchased a mobile home….really nice in a 55plus gated community. So excited! Today we are fogged in but it’s still so very mild here. All the best to you ?Liz, can’t wait to learn more about wine! How in the world did I overlook this message. I’m terribly sorry I can’t really say what happened but I always say better late than never. I must look for this wine o’clock and taste it as soon as possible. I wonder what it fills like living in a mobile home but the community sounds great and that’s what matters, really. Thanks Sandy and once more I apologize profusely for overlooking this message! A very nice presentation for this great Mediterranean bread. Wonderful taste too. Thank you Silva. How goes life? wish you a pleasant week! Thank you Liz. These are raining days, so not so nice. Oh at least it’s not cold. Enjoy the rest of the week. And thanks so much for popping by, again! Good luck. it’s very tasty. Have a fantastic week! Oh this makes me hungry! 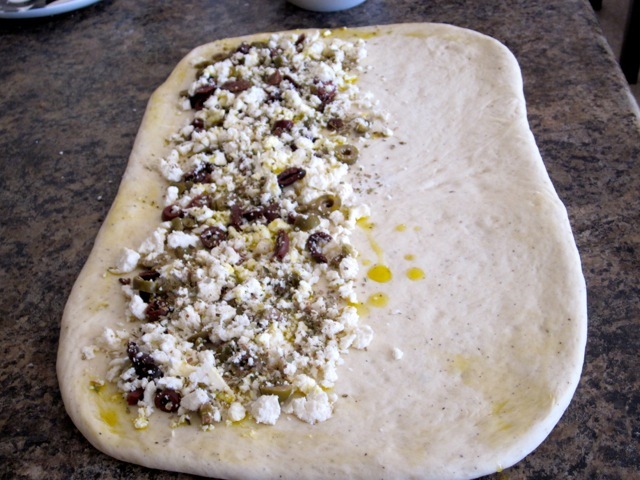 Love the olives and feta. Me too!!! I am almost serving dinner, thank God! On the other hand, it’s almost like you’ve posted a whole cook book! Maybe re-post up some of your faves on your off days? We all have them! Ha ha that’s a good idea. I can put a different sticky post every now and again. Watch the blog next week! I’ve just seen your photos. Great as usual. What more can I say? Have a fantastic week! Ha ha I can imagine. I am yes too all the way! Best wishes! This looks fantastic, and what a killer flavor combo!!! I love the stop-by-step photos, thanks for sharing! Thanks to you too for complimenting. This combo is a favourite of mine too. I wish you a very happy week! 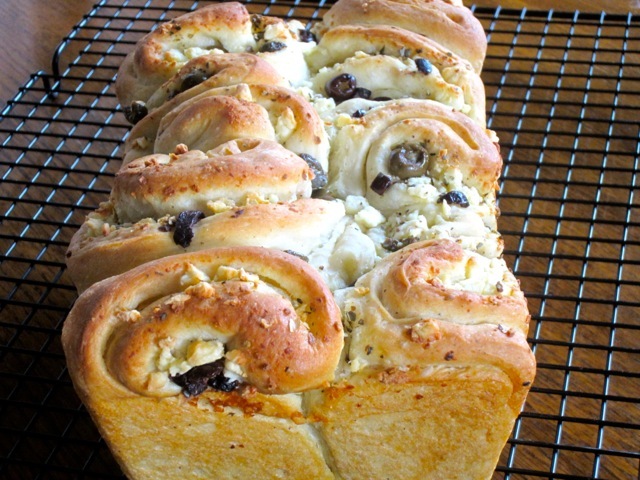 I love olive bread, and this looks magnificent! Thanks for sharing! Thanks. Me too and next time I’ll be snacking in the “bathroom” LOL!!!!! This looks absolutely delicious! 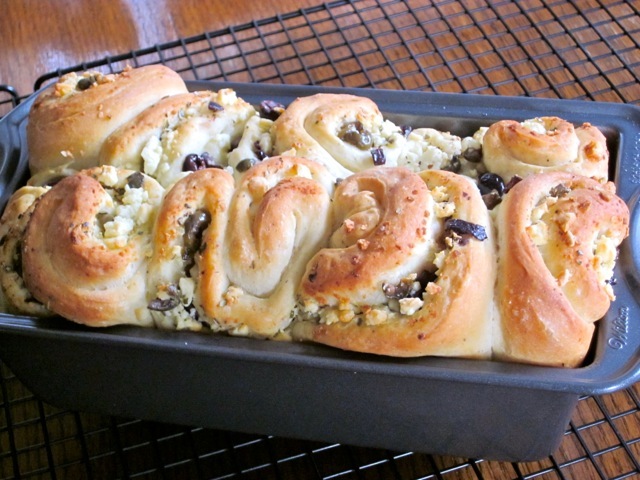 I love the combo of both feta and olives! Thank you Sara. I’ve enjoyed reading the shrimp recipe. I would love to try it. Have a pleasant week! 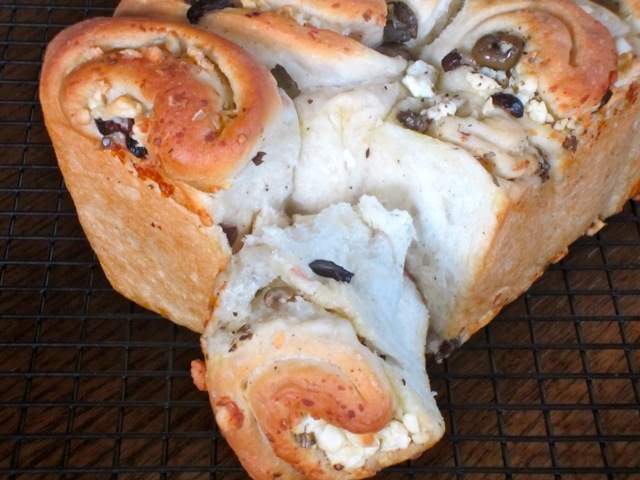 This feta and olive bread looks mouth watering! I have to try it out soon, thank you for sharing. Oh yeah it was more than mouth watering for sure. Thanks for complimenting! Have a great week! Liz, this bread looks incredible! 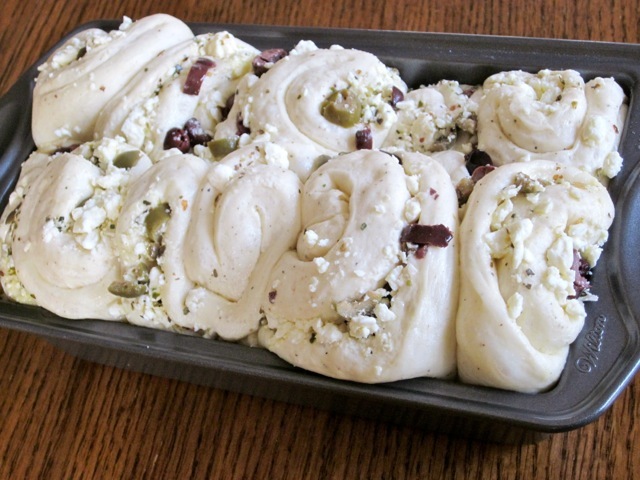 You put ingredients in it that I love so much – feta and olives. I would go crazy over this bread if I had some. I hear you about the prodding. I used to post twice a week, but due to the busyness of our lives right now, I had to go to once a week. That has worked out a lot better. Maybe sometime I will go back to twice a week, but until then this is perfect. I hope you find a middle ground, too, where you still get to post, but don’t feel so much pressure. In the meantime, I love what you do post, especially this bread! Thank God there is someone posting once a week. I think that would work out perfect for me. Why didn’t I think of that? I guess it’s because I want the blog to grow quickly but that is not feasible right now. Too busy with other things. Thanks so much for encouraging me. I think I’ll follow suit. Have a wonderful week! 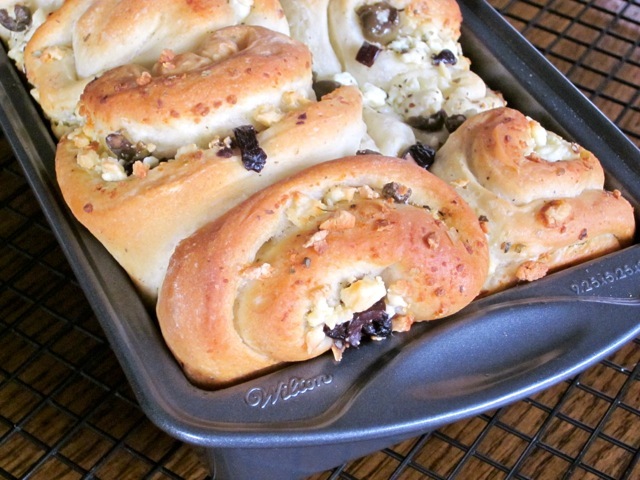 Pull apart and gobble! Those look sooo good. We are having a cloudy day with sprinkles – this lovely bread may cure the blues on a day like this. Long time no see. It tasted very good too! We have snow blowing all over the place. it’s so windy today. My yeast got finished I gotta replenish and start making bread again. Thank you. I am glad to see you too and congrats for the Gold. I wish I could ski….best wishes!